Sen. Richard Blumenthal, a Marine Corps reservist during the Vietnam War, wrongly claimed years ago that he “served in Vietnam” and once spoke of the mistreatment of Vietnam veterans “when we returned.” Those misstatements are fair game for his political opponents to criticize. But President Donald Trump has stretched the facts about Blumenthal’s misstatements to absurd lengths. Most recently, amid Blumenthal’s criticism of Trump’s Supreme Court nominee, Judge Brett Kavanaugh, the president falsely claimed Blumenthal “went around telling war stories,” claimed he “fought in Da Nang Province” and talked of “soldiers dying left and right as we battled up the hill.” Blumenthal never said any of those things. We generally let politicians fend for themselves when they are attacked for misstatements. When Trump tweeted in February 2017 that Blumenthal told a “major lie,” because he “never fought in Vietnam when he said for years he had,” we did not weigh in. But like a snowball rolling downhill, Trump’s account of Blumenthal’s misstatements has grown more exaggerated over time – particularly during Kavanaugh’s contentious confirmation hearings. So, here we will lay out the facts about Blumenthal’s time as a Marine reservist during – not in – the Vietnam War, and how those facts have been distorted. 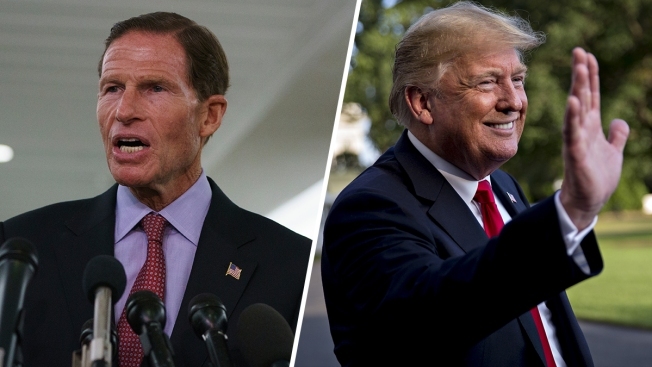 Blumenthal added that any claims he made to have served in Vietnam were “absolutely unintentional — a few misplaced words.” He said that he usually tries to be more precise in saying that he served in the Marine Reserve “during” Vietnam rather than “in” Vietnam. As we said, Trump has on severaloccasionsover the years ridiculed Blumenthal for his misstatements when talking about his service during Vietnam. The president ramped up those attacks after Blumenthal, a member of the Senate Judiciary Committee, questioned Kavanaugh’s credibility during the committee’s review of Christine Blasey Ford’s allegations that Kavanaugh sexually assault her in the summer of 1982. The same day, during remarks on the new United States-Mexico-Canada Agreement, Trump continued the attack. The following day, at a rally in Mississippi, Trump added a couple new wrinkles. Trump, Oct. 2: This guy lied about his service. He didn’t just say, “Gee, I was in the service.” No. He said, “I was in the Marines. Da Nang Province. Soldiers dying left and right as we battled up the hill.” This went on for 15 years when he was the attorney general of Connecticut. I thought he was a great war hero. And then it turned out he was never in Vietnam. He was in the Reserves. And I watched him two days ago. I watched him saying, “We need the truth. If we don’t have” — and here’s a guy who was saying people were dying all around him and he was never there. And then he cried. When they caught him, he cried like a baby. … And the reason he got elected is because in Connecticut it’s impossible for a Republican to get elected. And I did well there. But you can’t. He actually gave up the race. You’d thought he lost. You remember that? He, sort of, gave — he stopped campaigning. It was over. And then he won by three points. Here’s a video of Blumenthal’s initial response on May 18, 2010, to the New York Times story, in which he said, “I misspoke about my service.” No tears. And here’s a video of Blumenthal’s speech at the 2010 Connecticut State Democratic Convention on May 21, 2010. No crying. And here’s a video of Blumenthal talking to the media on May 24, 2010, after he released a statement apologizing for his “mistakes.” Again, no crying, no tears. Blumenthal never dropped out of the 2010 Senate race. And while a poll taken immediately after the Times story broke in 2010 showed that Blumenthal’s sizable lead had dwindled to just 3 percentage points, he actually won the general election by a dozen percentage points over his opponent, Republican Linda McMahon. That was by no means the “closest ever” Senate race in Connecticut history. As the Washington Post Fact Checker pointed out, Sen. Joseph I. Lieberman won by a smaller margin in 1988 and 2006, as did Sen. Lowell Weicker in 1982. Blumental was reelected in 2016 by a nearly 29-point margin. So to recap, based on what we know from the public record: Blumenthal did not say he was a “war hero.” He did not say he fought in Da Nang Province. He never bragged about battles. He never talked about “soldiers dying left and right as we battled up the hill.” He never said “people were dying all around him.” He never “went around telling war stories.” He apologized and said he “should have been more precise” in his language, but he didn’t “cry like a baby.” He never “dropped out of the race,” or “stopped campaigning.” He didn’t eke out a win “by three points”; he won by a dozen points. And that wasn’t nearly the “closest ever” Connecticut Senate race.